Applications for the National Youth Film School 2018 will close on May 21st. Young Irish Film Makers have been running the National Youth Film School since 2002 to train young people in all aspects of filmmaking. 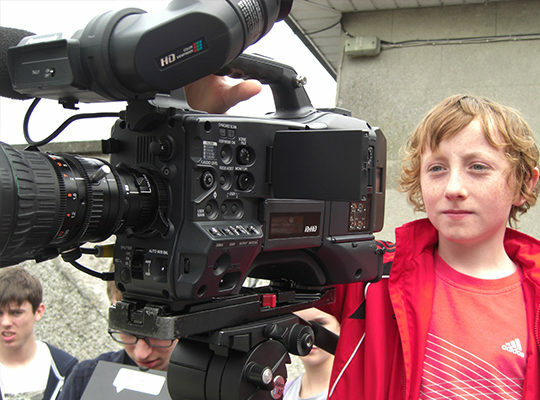 After the success of last years National Youth Film School the Young Irish Film Makers will again host it’s 10-Day residential film camp in partnership with The National Film School at IADT in Dun Laoghaire and with funding from the Irish Film Board. A Residential Film Camp will accommodate young filmmakers from all over Ireland to immerse them in the world of filmmaking with practical training workshops, intensive shooting days and long hours in the edit suite. Script to Screen Training and mentorship through every step of the filmmaking process; Facilitating the students to actively learn the skills and job roles involved in preproduction, the shoot and finally edit workflow. Portfolio Workshops will be hosted at The National Film School in IADT for students who are preparing to apply for college to study film, television or broadcast media. This unique workshop gives students the tools they need to present their work in a portfolio format. This year will also see the National Youth Film School host its first Residential Animation Course a 5-Day mentorship training course giving attendees the opportunity to work and learn from professional animators on the comprehensive nature of the animation process. With Kilkenny being the hometown of Cartoon Saloon you never know who might pop in to share their experience, wisdom and expertise. This is a unique opportunity for young people (16-19yrs) planning a career or college placement in Film, Television and Animation. Interactive workshops in all aspects of filmmaking – from writing to lighting, production to editing – all with experts in the field, coupled with the experience of working on a professional film crew, is not to be missed. The final films will premiere in front of an industry audience in the autumn to showcase the young talent. Over the years, the National Youth Film School has attracted young people from all over Ireland, Europe and even the USA for this one-of-a-kind opportunity to work at a professional level on a broadcast quality film production. Many young people have used their work with YIFM as a portfolio piece and gone on to attend film schools such as The National Film School at IADT in Dun Laoghaire. Industry backing for NYFS comes from Screen Training Ireland, the Screen Directors Guild and Screen Producers Ireland. Screenwriters working with the film school in the past have included Will Collins (Song of the Sea), Ailbhe Keogan (Run & Jump), Colin Thornton (Date for Mad Mary) and Hugh O’Connor to name a few. All of this support for NYFS, puts it streets ahead as the premiere film training programme for young people in Ireland. Young Irish Film Makers have been producing films with young people all over Ireland since 1991 and boast past members such as Oscar-nominated Tomm Moore (Writer/Director of ‘Song of the Sea’), Luke Harris (3D animator at Brown Bag) and John Morton (Creative Director of Devious Theatre Company). The National Youth Film School has limited capacity and the closing date for registration is May 21st. To Register interest in the National Youth Film School, go here. For more stories on the Young Filmmakers, go here.